Pomellato bracelet form the Tango Collection. 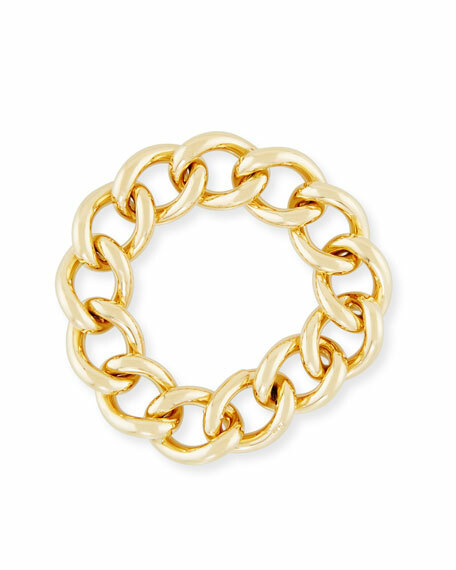 Polished 18-karat yellow gold curb links. In 1967, an heir to a family of goldsmiths Pino Rabolini upended the conservative Milanese jewelry space by introducing a fashion-forward philosophy. Now, the house has rightly earned the status as iconic for sophisticated stone color combinations, special cuts, and unconventional designs. Pomellato marries history with the cutting edgean avant-garde sensibility executed through impeccably crafted details. Pieces are crafted using a lost-wax casting technique (dating back to Ancient Egypt) as well as with the most sophisticated machines. This combination of tradition and innovation yields jewels that express an authentic artisan touch and unique personality. Most notably, the best-loved Nudo Collection showcases the beauty of stones through sleek and simple earrings, rings, and pendant necklaces.